The nose has elderflower, lime and a hint of honey. The mouthfeel is thin with no cling. The body has lemon, banana and a hit of chilli powder. The finish is growing chilli notes, with a little lime and lemon. Water brings out thin, rapidly expanding wholring that dissipates quickly without mottling. The nose gains nutty notes - like the remnants of a bowl of mixed nuts. The elderflower is gone. The body gains more chilli, and honey roasted nuts. The finish gains more chilli. 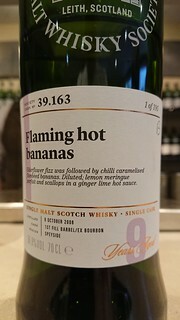 Too much chilli for me, but a delightful young dram for spring mornings.